True to the OG lineage, True OG kush brings strong head-high affects with a classic indica body rush. A frequent winner of medicinal competitions, this weed is also loved by recreational users. Fitting that we’d buy originally ocean-grown weed from an Oceanside shop, the experience couldn’t have been better. The pot shop this strain was sourced from is one of our new favorites. The only shore-side weed store in Washington, Have a Heart Ocean Shores has the friendliest budtenders and a fantastic selection. Their energy couldn’t have been more on point, and after stopping for a photo with the gang, we picked out this great treat. Nugs: Medium, spongey, yellow tinge. Bright. Odor: Sour and skunky, like the tart original frozen yogurt. Smooth, creamy and pine-y. Taste: Earthy, light, Flavor tastes round-smoke it and you’ll agree! High: Mellow, warm, enveloping. Pleasant and comforting. Like being held in a hug. Your nose is welcomed by delightfully sour skunk and sweet notes as soon as the package was opened. The nugs were spongey and filled with trichomes. These buds were grown and delicately cared for by Rogue Raven Farms and the quality is apparent, in sight, smell and experience. Highly recommended by the friendly faces at Have a Heart, I’m sure we’ll be going back for more. 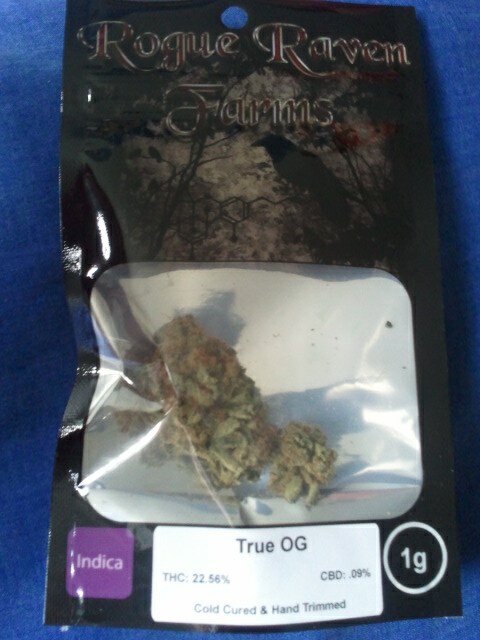 A descendant of OG Kush, some say True OG has Afghani roots. The high is euphoric, relaxing and felt as a warm hug enveloping your spine. It’s the perfect indica: you can easily slip into an effortless slumber or enjoy the calmness of the present which the high holds you in a comforting grasp. This is the lying-on-a-bearskin-rug-by-the-fireplace-with-smooth-jazz-quietly-playing-as-you-sip-wine experience. 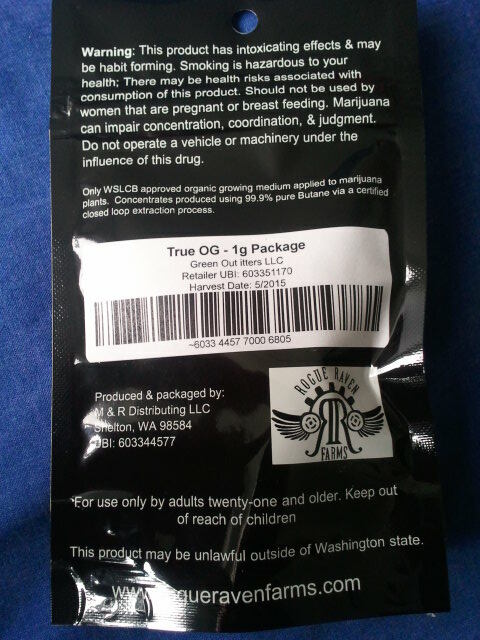 True OG holds your head and relaxes your mind. We picture this weed being perfect around a crackling campfire. Hold the smoke in your lungs and breathe out the pine-tasting smoke. The pungent smells fill the air and the taste quenches your thirst. Explosions of elevated vibrations; enjoyed for hours.